Republican presidential candidate Donald Trump finally responded to Boing Boing's uncovering of a 1920s-era story reporting the apparent arrest of his father at a Ku Klux Klan Rally in Queens. As one might expect from The Donald, he confirmed it, denied it, and got angry with "that little website." 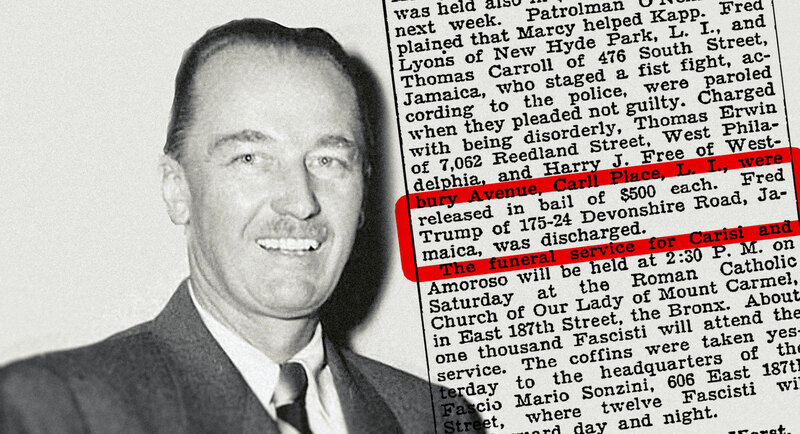 But it wasn't our reporter, Matt Blum, who wrote that Fred Trump shared lawyers with men charged with attacking cops at the Klan "parade"—it was an unbylined Times writer with no idea of the then-young Fred Trump's future significance as a real estate mogul. And it's present-day Times journalist, Jason Horowitz, to whom Trump stumbled through his excuses. "Mr. Trump’s barrage of answers – his sudden denial of a fact he had moments before confirmed; his repeatedly noting that no charges were filed against his father in connection with the incident he had just repeatedly denied; and his denigration of the news organization that brought the incident to light as a “little website” – shows his pasta-against-the-wall approach to beating down inconvenient story lines," writes Horowitz. Trump—who recently described Mexican immigrants as rapists and has a history of dubious comments about minorities—inherited his father's fortune. But he also worked alongside and was mentored by him as a young man. A 1979 article, published by Village Voice, reported on a civil rights lawsuit that alleged the Trumps refused to rent to black home-seekers. It also quotes a rental agent who said Fred Trump instructed him not to rent to blacks, and to encourage existing black tenants to leave. The case was settled in a 1975 consent degree described as "one of the most far-reaching ever negotiated," but the Justice Department subsequently complained that continuing "racially discriminatory conduct by Trump agents has occurred with such frequency that it has created a substantial impediment to the full enjoyment of equal opportunity." Trump is currently the runaway leader among Republican voters, enjoying more than 30 percent support in some polls.